My father's mother's name was DeWitt. Frances DeWitt. Her father was Warren DeWitt. I have two family Bibles that my grandmother passed on to my father, which are now in my possession. The first one has only one generation's records in it - an Elizabeth Bennett and Benjamin Neal, born 11/7/1780 and 3/17/1781, respectively, and their children, Jonathan (b. 1/28/1801), Bersheba (b. 8/10/1803), Ira (b. 9/12/1804), Abigail (b.2/9/1807) and Elizabeth B. (b.3/6/1813). The handwriting is elegant and spidery and the Bible itself is as old as the writing. I have no idea who the Neals are and how they tie into my family history, except I'm sure it's on the DeWitt/Doolittle side and that, possibly, Elizabeth B., the daughter, married a Henry DeWitt in Oak Hill, NY. That is the second Bible I have - a pew Bible which says in large, flourishing script, "Mr. Henry DeWitt's Bible, St. Paul's Church, Oak Hill, Aug 9, '49 (which would be 1849). In small letters in barely legible pencil it says on the inside cover, "Eliza DeWitt, Oak Hill", twice - she wrote it twice in much smaller, more delicate writing than Mr. DeWitt. So I am left wondering if Eliza DeWitt is the married name of Elizabeth B. Neal, born in 1813. I found one record on Ancestry.com of a Warren DeWit - who is my great grandfather - in Greene County, NY, which is where Oak Hill is, but I can't find him associated with a Henry DeWitt. Warren is 23 in this 1870 census record and he lives with Eliza who is 57, and, I presume, his mother. She keeps house and he is a farmer, His property is worth 2000.00 and his personal assets are $800.00. 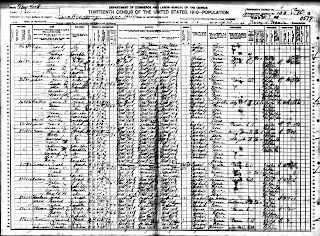 This DeWit is spelled with only one "t" at the end, but census takers have notoriously been known to be inaccurate, so it could still be my ancestor. The dates are right, the place is right, and his mother's name is Eliza - and her age is right, too - she was born in 1813, so I'm pretty sure it's my great-grandfather. Warren DeWitt married Minnie Doolittle. Minnie Doolittle was born 3/31/1864 and Warren was born 12/31/1846. Their first child, William - my great-uncle Will who fought in WWI - was born in 1884, so sometime before 1884 hopefully Minnie and Warren were married. I say hopefully because Minnie's family did not want her to marry Warren - perhaps because he was so much older than she - I've just heard that they didn't like him. Their age difference would have made him 37 when she was 19, a spread of 18 years. That doesn't sound shocking today, but perhaps back then it was. The next mention of Warren DeWitt (with 2 "t"'s now) is in 1910 in Saratoga Springs, NY. He is married to Minnie. Warren is 63 and she is 45. At that point in time, their son Will has left home - he is 26. Maud has also left - she married someone named Schwingler - she is 23. Ira is still at home at age 21, then there is Fannie - my grandmother - who is 13 and Mabel, the youngest, who was 11. And last, but not least, listed as a granddaughter, is a Dorothy Smith, age 2. Huh? It can't be Fannie's or Mabel's. It can't be Ira's or Will's because their last name is DeWitt - unless this is a mistake of theirs. It can't be Maud's - she is already married to Mr. Schwingler. Very strange. And very interesting. And, at age 63, Warren DeWitt has been out of work all of 1909 and some of 1910. And, though he is listed as owning the property, it is mortgaged. Hopefully, Ira is working and contributing. The property is on Gilbert Road, which still exists separated from Saratoga Springs by the Northway superhighway today. If I look at Google earth, I can see Gilbert Road, which is still quite rural. Many of the properties listed on it in 1910 were farms. Here it is today on Google maps. No one has taken pictures along it, so you can't go to street view, darn it. The Saratoga Springs directory of 1891-92 says Warren H. (for Henry?) DeWitt has 2 locations - one at 113 Clinton Street, which is sort of a messy neighborhood today, and one at 26 Catherine, which building no longer exists. I don't know why he has 2 locations - perhaps he worked for two different people, depending on work load. Keep digging for your roots. You never know what cool things you will find out. This is an "Off Topic Comment" but...I seem to have lost my knack for posting/commenting in 'Blog Land,' for a while. All I do lately, is put up a few photos, here and there. I didn't plan on it... It just happened. And since I don't want anyone to think I got *uppity* or anything, :-) I'm leaving this comment, to explain my absence. Cathy S. - I plan on continuing - it is fascinating to me. Smilnsigh - Don't worry - I don't expect readers to post very often. I'm going to write on this blog whether people post or not. I hope all is well with you - and I would never think you are "uppity"! !